The MD program is comprised of four geographically distinct sites including the Island Medical Program (IMP), Northern Medical Program (NMP), Vancouver Fraser Medical Program (VFMP), and the Southern Medical Program (SMP). There are 288 spots for incoming students, 32 for the IMP, NMP and SMP each, and 192 to the VFMP. The possession of the Doctor of Medicine does not, in itself, confer the right to practice medicine in any province in Canada. Each province has a college of physicians and surgeons, as mentioned previously, and these colleges have the final authority to grant a licence to practice medicine within their jurisdictions. The possession of the Licentiate of the Medical Council of Canada (LMCC) is one of the major requirements of the provincial colleges of physicians and surgeons for registration. For information regarding registration and licensing in British Columbia, please refer to College of Physicians and Surgeons of British Columbia. Applicants with Certification by the College of Family Physicians of Canada or the Royal College of Physicians and Surgeons of Canada and being Licentiates of the Medical Council of Canada will also qualify for licences to practice. For more information, please visit the UBC Faculty of Medicine’s Student & Learners webpage. Whether you are a prospective, new, or current M.D. undergraduate student, you will find information relating to student services such as Financial Assistance, Academic Counseling, and Student Support on the UBC Faculty of Medicine’s M.D. Undergraduate Resources & Support webpage. Students are exposed to introductory concepts of Psychiatry in Foundations of Medical Practice (MEDD 411 and MEDD 421). Students are exposed to case-based presentations and clinical settings where they gain interview practice in the Foundations of Medical Practice (MEDD 412) and Transition into Clinical Education (MEDD 422) courses. Students also have the opportunity to pursue psychiatry related learning projects as part of the Foundations of Scholarship and Flexible Enhanced Learning course (MEDD 419 and MEDD 429). Clerkship (MEDD 431) is a 12-month course where students gain core experiences across the breadth of medicine through both clinical and academic learning opportunities. Psychiatry provides a six week rotation through the Brain and Body Block. 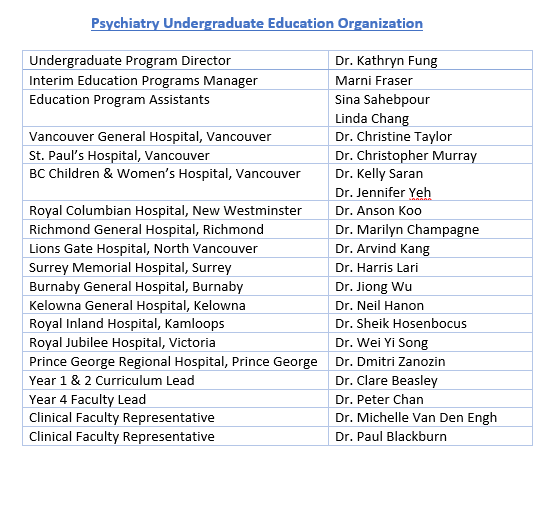 Students will interact with adult and child patients under the supervision of psychiatrists in order to develop a solid foundation of knowledge, skills, and abilities described by the UBC exit competencies. During the six week rotation, students will learn to complete a diagnostic evaluation and formulate an appropriate treatment plan for a patients presenting with a mental health concern. Online learning resources for Year 3 Psychiatry can be found on MEDICOL. Please refer to one45 for the most up-to-date list/offerings. Visiting students from approved universities are welcome to enroll in a psychiatry elective in their final years of medical school. Please refer to the Visiting Student Elective Program. Online learning resources can be found at Medicol.